Quarterback Johnny Manziel, a former Heisman Trophy winner who fizzled in the N.F.L. and was kicked out of the Canadian Football League, signed with the Alliance of American Football on Saturday night and will join the Memphis Express. Manziel’s rights belonged to San Antonio of the spring league, but that team declined to sign him and Manziel was then free to join any of the other seven clubs. He was awarded through the A.A.F.’s waiver system to the Express, who have a league-worst 1-5 record. “We are pleased to welcome Johnny Manziel to Alliance of American Football, which we’ve always described as a league of opportunity for talented players to launch or revitalize their pro football careers,” the Alliance co-founder Bill Polian said in a statement released by the league. Manziel is expected to report to the Express on Sunday. “Welcome to the 901 @JManziel2,” the team wrote on its official Twitter page. 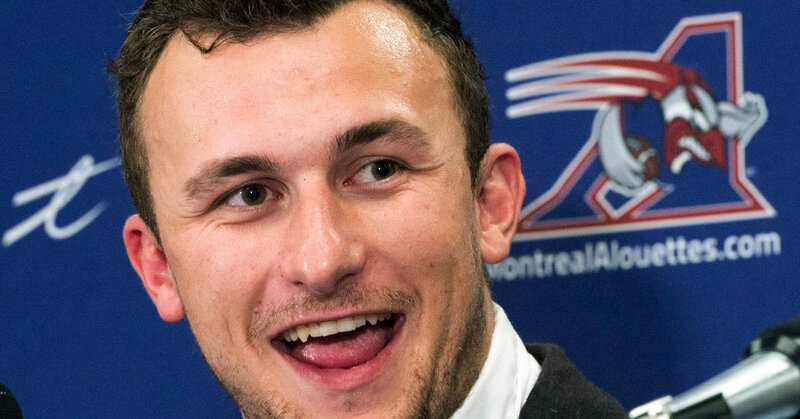 Manziel, the 2012 Heisman winner at Texas A&M, had his contract with the Montreal Alouettes terminated this off-season. The C.F.L. said that he violated his agreement with the league, but it has offered no specifics about the deal. Before he entered into negotiations with the Hamilton Tiger Cats last March, Manziel had to agree to several strict provisions, presumably because he had a history of substance abuse and arrests, including one related to accusations that he had struck a former girlfriend. He was 2-6 as a starter with the Alouettes last season, completing 106 of 165 passes (64.2 percent) for 1,290 yards with five touchdowns and seven interceptions. He also ran for 215 yards on 29 carries as Montreal (5-13) missed the C.F.L. playoffs. In Memphis, the 26-year-old Manziel could have an opportunity to play quickly. Express quarterback Zach Mettenberger injured an ankle on Saturday and was unable to return to the team’s 22-9 loss at Salt Lake, and his status is uncertain.